More affordable, KISTERS' software features advanced tools commonly thought exclusive to CAD systems. Project managers and sales representatives in the tool making, casting, mold/die and plastic injection industry routinely respond to customers request for the cost of producing a specific part. The part must be inspected and analyzed to draw conclusions and provide a quote. Typical, basic functionalities that support inspection and analysis processes are the loading of native CAD files, volume calculations, measurements, dimensions, sectioning, and annotations. In addition, companies often need the ability to isolate and inspect parts in order to perform a more advanced analysis. With 3DViewStation, results of this work can be organized into views and easily saved for later retrieval. 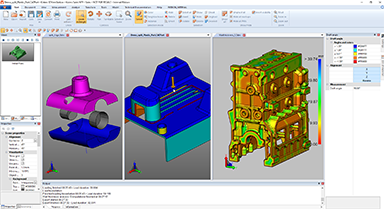 “There's a common misconception that industry-specific analysis functions are only available in a CAD system. However 3DViewStation readily provides these functions, and the easy-to-use software comes at a much lower price point,” said Tammy Pleasent, KISTERS North America Sales Manager. “One typical industry-specific required functionality is draft angle analysis, assisting in the identification of undercuts. “Complementary functions for this process are our real time wall thickness measurement, projected area calculation and analysis of the complete part, which shows results by color coding the object and supplying an easy-to-decipher color key,” Pleasent added. The advanced functions are available in both the Desktop and WebViewer versions of 3DViewStation. Therefore, users can access the helpful tools in a stand-alone or integrated environment on any leading system such as an ERP, MES or PLM system by leveraging high level APIs. Known for its modern user-interface, high performance viewing, advanced analysis and integration capabilities into leading systems, 3DViewStation installs with current and mature importers for a broad range of 3D and 2D formats -- including Catia, NX, Creo, SolidWorks, SolidEdge, Inventor, JT, 3D-PDF, STEP, DWG, DXF, DWF, MS Office and many more. The latest 3DViewStation developments can be found at www.3dviewstation.com/blog.html.